MLi Environmental assists hospitals and retail pharmacies with their drug disposal needs. We can properly manifest and pack all levels of pharmaceuticals, EPA, RCRA waste coded drugs, DEA regulated drugs, biomedical, and wasted drugs. Pharmaceutical waste includes hazardous chemical waste, controlled substances, and biomedical waste. Your facility likely houses a number of pharmaceutical waste items such as expired drugs, discarded personal medications, containers with excess drugs (IV bags, tubing, vials, etc. ), containers with chemotherapy drug residues, open containers of drugs, and containers that held acute hazardous waste (P-listed) drugs. In order to remain in compliance with regulations, proper classification is needed. Is your hospital or pharmacy prepared? Are you aware that possessing more than a kilogram of RCRA ‘P- listed’ requires administrative paperwork? What is P-listed waste? What needs to go for Direct Incineration? Which materials are considered Biomedical waste and can it be autoclaved? If the state arrives for inspection, these are a few of the questions your facility should be prepared to answer. Your facility likely generates non-hazardous pharmaceutical waste as well. 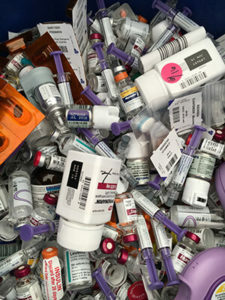 Non-hazardous waste may include expired drugs, personal medications, discontinued, unused, undispensed vials and IVs, non-hazardous chemotherapy agents and spilled or broken materials. Non-hazardous pharmaceutical waste is not reportable currently and can be shipped for disposal using a bill of lading. It is suggested that non-hazardous pharmaceutical waste be incinerated at a regulated hazardous waste incinerator. This process ensures complete destruction of waste and reduces your facility’s liability.